Randolph Charles Bachman was born in 1943 in Winnipeg, Manitoba. When he was just three years old he entered the King of the Saddle singing contest on CKY radio, Manitoba’s first radio station that began in 1923. Bachman won the contest. When he turned five years he began to study the violin through the Royal Toronto Conservatory. Though he couldn’t read music, he was able to play anything once he heard it. He dropped out of high school and subsequently a business administration program in college. He co-founded a Winnipeg band called The Silvertones with Chad Allan in 1960. In 1962 the band became Chad Allan and the Expressions, and was renamed The Guess Who? in 1965 with their first big hit, “Shakin’ All Over”. The Guess Who dropped the question mark in their title a few years later. Burton Cummings replaced Chad Allan and the band went on to score major international hits like “American Woman” and “These Eyes”. 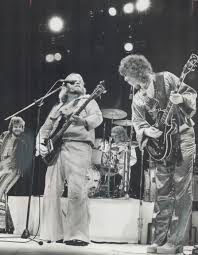 While “American Woman” was #1 in May 1970, Randy Bachman left The Guess Who, in part due to his zeal for Mormonism. Bachman released a solo album called Axe, and in 1971 formed a band called Brave Belt. This included his brothers Robbie and Tim and Chad Allan. Fred Turner then replaced Chad Allan. Their country-rock sound was quieter then the rock n’ roll of the Guess Who. At a concert in Thunder Bay, Ontario, Brave Belt was asked to play a set of classic rock songs. 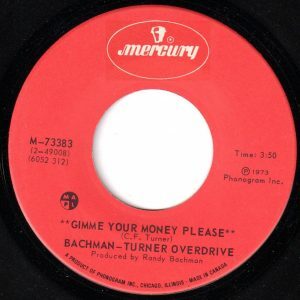 As written in Michael Heatley’s The Turbulent History of Bachman-Turner Overdrive, Bachman recalls in “We instantly saw the difference between playing sit-down music people could talk over and playing music they would jump out of their seats and dance to.” By 1973, they were billed as the Bachman-Turner Overdrive. In the mid-70s the BTO would have a half a dozen Top Ten hits in Canada and a #1 internationally with “You Ain’t Seen Nothing Yet”. In the 1970’s BTO sold over 7 million albums. Their 1970s catalog included five Top 40 albums and six Top 40 singles. Over the years the band has sold nearly 30 million albums worldwide. In 1973, BTO had a self-titled debut album. Although the formation of BTO didn’t involve a typical Top 40 single on their debut album, their constant touring gave them a base ready for their subsequent releases. The second single release from the album made the Billboard Hot 100 and the Canadian RPM Top 40. The song was called “Blue Collar”. BTO would enjoy a series of Top Ten hits over the following years including “Talkin’ Care of Business”, “You Ain’t Seen Nothing Yet” and “Roll On Down the Highway”. BTO recorded nine studio albums between 1973 and 1979 and in 1984. Seven singles made the Top 20 on the Canadian RPM charts, and three of these made the Top 20 on the Billboard Hot 100. BTO had ten singles reach the Top 20 in Vancouver. Their singles, like “My Wheels Won’t Turn”, had little traction elsewhere. Another of these was “Gimmie Your Money Please”. “Gimme Your Money Please” presented an all too believable narrative, substantiated by headlines coming out of the Big Apple. “Gimme Your Money Please” climbed to #12 in Vancouver. However, it got little airplay elsewhere, barely making the Top 30 in Ottawa. It made the Top 40 in Tucson, Arizona. In addition to songs like “Gimme Your Money Please”, there were other artistic responses to the economic decline of New York City and the increase in crime, prostitution and drug dealing. In 1974, the film Death Wish, starring Charles Bronson as Paul Kersey, an architect who becomes a vigilante after his wife is murdered and his daughter sexually assaulted during home invasion in Manhattan. In 1976, Robert De Niro starred as a taxi driver named Travis in the film Taxi Driver. Travis Bickle is a Vietnam veteran who is lonely and isolated after coming home. He gets a job as a taxi driver to deal with his insomnia. Set in a decaying New York City of the 1970’s, after the Vietnam War ends, Travis Bickle becomes more troubled. He plans to assassinate a presidential candidate. This fails, but he decides to murder the pimp of a teenage prostitute he’s become acquainted with. Both Death Wish and Taxi Driver gave movie goers an apprehension about New York City. It was no longer a city you’d want to be apart of, for fear of being, robbed, beaten, raped or murdered. And Greenfield described an almost dystopian scene in “New York Is Closed Tonight“, inspired by the aftermath of a garbage strike in the late ’60’s in Manhattan. In 1977 Bachman went solo and released an album called Survivor in 1978. From the album came the single release “Is The Night Too Cold For Dancin’?” After his solo release, Bachman went on to form the band Ironhorse in 1979. Bachman subsequently went on reunion tours with The Guess Who in the 1980s and played with them at the Pan-Am Games in Winnipeg in 1999 and, more recently, in 2003. Bachman also toured almost continuously with BTO from 1983 to 1991. He’s also released over a half a dozen solo albums between 1992 and 2015. In 2002, as a member of The Guess Who, Bachman was one of the former bandmates who received The Governor General’s Performing Arts Award, a Canadian award noting excellence in the performing arts. Bachman has also received the distinction of being made an Officer of the Order of Canada in 2008. Since 2005 Randy Bachman has hosted a pop music retrospective show on the CBC called Vinyl Tap. Songs like BTO’s “Taking Care Of Business” have been referenced in the TV show The Simpsons. C. F. “Fred” Turner had a vocal appearance with Randy Bachman on an episode of The Simpsons in 2000. Since 2005, Randy Bachman has been a host of Vinyl Tap,a show on CBC Radio where he plays sets of pop tunes and discusses some of the details he knows about the performers and musicians he’s met. In 2008 Randy Bachman was awarded the Order of Canada. This is a medal given by the governor-general of Canada to persons who have made a major difference to Canada in their field of work. Michael Heatley, From Rags to Riches and Back: The Turbulent Story of Bachman-Turner Overdrive, Team Rock.com, Bath, UK, December 17, 2016. Randy Bachman, Vinyl Tap, CBC, Toronto, Ontario. LDS PROPHET Brigham Young, JoD, vol.7, pp. 289-91.